History is full of strong, complicated women. No matter where you look in history, odds are high that you will find a woman who’s made a significant difference. Regardless of whether or not their contribution was to be cheered or jeered, you cannot deny that some of the most fascinating people in history just happened to be women. In some instances these women risked ostracization or worse, as their actions went against the expected gender roles for their time and culture. As such, it’s unsurprising that Tamar Carroll’s class at the Rochester Institute of Technology had American Women’s and Gender History as their focus. One such interesting woman is Kateri Tekakwitha, an Algonquin–Mohawk tribeswoman who chose to go against the expectations of her tribespeople in order to convert to Catholicism and pursue a lifetime of chastity. Refusing to marry her family’s choice, Tekakwitha joined a mission in 1677 and in 2012 was canonized as a saint, making her the first Native American woman of North America to be canonized by the Roman Catholic Church. Students also worked on articles about women such as Lotte Reiniger, who created The Adventures of Prince Achmed in 1926, now considered to be the oldest surviving animated feature film. Reiniger is considered to be the foremost pioneer of silhouette animation and her work has influenced many creative professionals, which can be seen in films such as the opening for the 1940 Disney masterpiece Fantasia. Another focus of the class was women who worked with science and the community, as in the case of Mary Richmond and Kate Gordon Moore. Richmond was a social worker active in the late 1800s and early 1900s, whose works still impact social work education today. Gordon Moore was a psychologist who focused on color vision and memory in her early career. Her research focus shifted twice during her career, from color vision to education and then to the imagination. 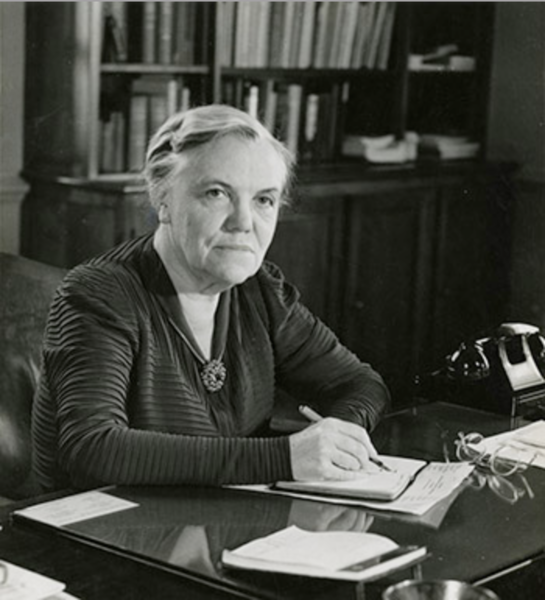 The article for Katharine Blunt was also edited to include mention that Blunt — a chemist, professor, and nutritionist — worked within the field of home education in the early 1900s, a field that offered many women the chance to enter the male-dominated academic community of the time. Students also focused on women with more complicated histories and careers. Sybil Neville-Rolfe is one such woman, as she was a noted social hygienist and a founder of the Eugenics Society. Neville-Rolfe believed that a person’s worth was determined by their genetics — a person with good genetics would become successful and that someone with poor genetics would not, regardless of their backgrounds. In contrast to some eugenicists, however, Neville-Rolfe did not automatically assume that unmarried mothers or prostitutes were automatically genetically deficient. She instead believed that these women were victims of the poor morals of the era and argued that steps should be taken to provide them with better education and support. Neville-Rolfe would likely have held the same opinion of another woman the students wrote about, Sarah Grosvenor. Grosvenor lived during the colonial era, which lacked the high tech health care that many of us enjoy today. She became pregnant in her late teens while in a secret relationship with an unmarried man in his twenties. As pregnancy out of wedlock was heavily frowned upon and her lover was allegedly uninterested in marrying her, Grosvenor sought out an abortion from her local physician. Just over a week after the procedure was completed and Grosvenor miscarried, the young woman grew sick and died, likely due to the procedure being done in unsanitary conditions. Are you interested in having your class participate in Wiki Education’s program? If so, contact us at contact@wikiedu.org to find out how you can gain access to tools, online trainings, and printed materials. Header images: File:Katharine Blunt.png, by ConnColl Collections, CC BY-SA 4.0, via Wikimedia Commons. File:Lotte Reiniger 1939.jpg, public domain, via Wikimedia Commons. File:Penelope Barker (1728 – 1796).jpg, public domain, via Wikimedia Commons.